With spring here, and a few warm days to go along with it, we realized that Ava has grown a lot since this time last year. The poor girl had only one pair of shorts that fit her, so we went to Target last night to get her some warm weather clothes. Of course, she's my daughter so she looks great in everything, so this post isn't really about her. Blake saw a hat and tried it on, and just lit up. 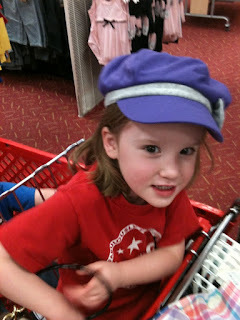 He likes shopping for clothes about as much as any other six year-old boy, which is to say not at all. So when he liked this hat that much, we decided to get it for him. Jack has one main interest in life, and that is "whatever Blake is interested in." This morning when he found the hat unattended for a second, he grabbed it and put it on. I just had to put a side-by-side photo of them both on here, because sometimes I'm still amazed by what very different people my two sons are, even at such an early age. Blake looks like a little hipster, about to jump on his fixed-gear bike and go to a Decemberists show or something. Jack is just a popped collar and fist pump away from looking like he should be picking a bar fight on "Jersey Shore." ﻿Oh, OK. Here's Ava in a hat, too. Oh, dude, I'm sorry. You call Ava your girl, but that beautiful fact is all her mama! Oh, I know! Sometimes they nap together, and when you see their faces side by side in their sleep, they look exactly alike. I think that's why she can always get just what she wants out of me! your descriptions of the boys made me LOL. and, i agree with andrea, that is a beautiful face!